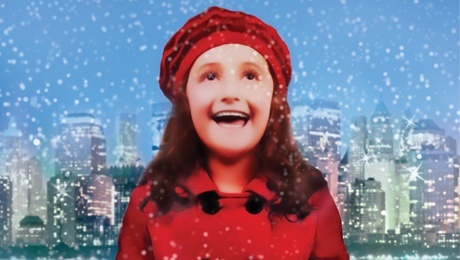 Based on one of the most popular and best-loved Christmas films of all time, classic musical MIRACLE ON 34th STREET will play at the King’s Theatre Glasgow from Thursday 19 to Saturday 21 November as part of a UK Tour this Christmas. On sale now. Based on the 1947 motion picture, Miracle on 34th Street is the heart-warming story of Susan, a young girl who dreams of a father and brother to make her family whole, and Kris Kringle, a kindly old bearded man who claims he is the real Santa Claus. When employed as a Santa at a department store grotto, Kris quickly spreads a wave of love through New York City, but can he help make Susan’s wish come true? This dazzling musical is an uplifting family tale about what it truly means to believe. Miracle on 34th Street originated as a 1947 motion picture starring Maureen O'Hara, John Payne, Natalie Wood and Edmund Gwenn. The film became a perennial Christmas favourite, winning three Academy Awards and nominated for Best Picture. The stage version, originally entitled Here’s Love, opened on Broadway in 1963. A hugely popular remake of the film was also released in 1994 starring Richard Attenborough as Kris Kringle. Miracle on 34th Street has a book, music and lyrics by Meredith Willson, best known for writing and composing The Music Man which premiered on Broadway in 1957 and was adapted twice for film in 1962 and 2003. It won the 1958 Tony Award for Best Musical and the cast recording won the first ever Grammy Award for Best Original Cast Album. His work for film includes composing the score for Charlie Chaplin's The Great Dictator for which he received an Academy Award nomination for Best Original Score. The cast features Danny Lane as Kris Kringle, Hannah Thompson as Susan Walker, Claire Hawkins as Doris Walker, Carl Lindquist as Fred Gaily, Michael Adams as R.H Macy and Brendan Matthew as Marvin Shellhammer. The cast also includes Joanna Gregory, Emily Barnett-Salter, Charlotte Jay, Jessica Lucy, Kate Hulme, Jack Warren, Frank Derrington, Dann Kharsa, Toby Joyce andDavid Muscat.